How prepared are you and your organization to respond to a data breach? Executives and their teams in PR/Communications, Cybersecurity, IT, (external) Legal Counsel, and others, should all be intimately aware of the Breach Response Plan and practice their tasks regularly through a Cyber Breach Simulation, or Tabletop Exercise. 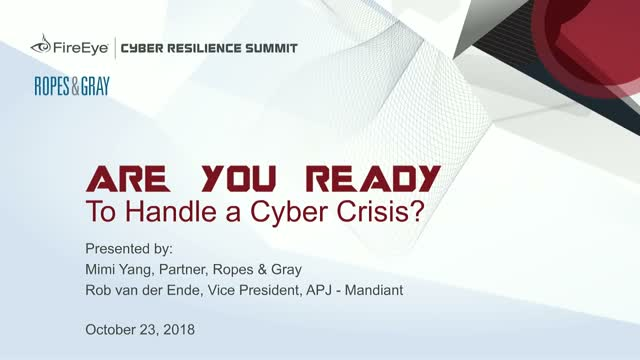 Ropes & Gray and Mandiant have joined forces to help you evaluate your organization’s ability to respond effectively to a cyber incident before it occurs. The Tabletop Exercise uses gameplay techniques to assess your cyber crisis processes, tools and proficiency from legal, governance and technical perspectives. During the exercise, multiple scenarios based on real-world experience are simulated in a roundtable environment, allowing Ropes & Gray to provide concrete legal advice to your organization based on the results, including advice on potential enhancements to your organization’s cyber breach and incident response preparedness that Mandiant and Ropes & Gray identify through the exercise. Ropes & Gray privacy & cybersecurity attorneys have advised and assisted clients in responding to cyberincidents of multiple shapes and sizes, including many of the largest incidents in history, and apply that extensive background to counsel clients on cybersecurity incident preparedness. Mandiant, a FireEye company, has over 14 years of near-daily interaction with organized, persistent attackers and threat groups around the world. Mandiant consultants spend hundreds of thousands of hours annually working with organizations of all sizes to remediate security breaches, identify vulnerabilities and provide guidance on closing security gaps. Title: Are you Ready to Handle a Cyber Crisis?